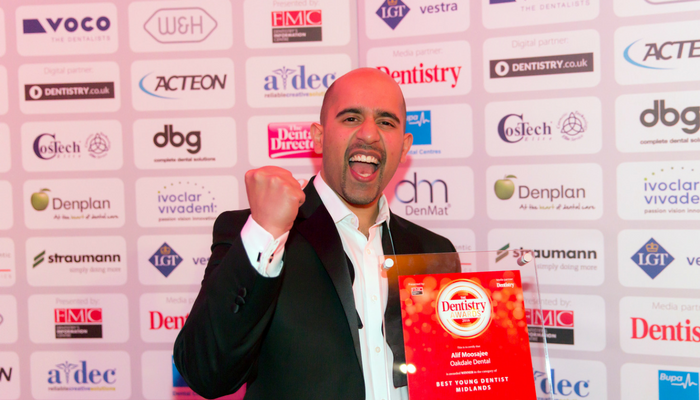 The UK’s Best Young Dentist, Dr Alif Moosajee – aka ‘The Smiling Dentist’ – shares some insider knowledge on perfecting a dazzling white and healthy smile that not only looks great but feels good, too! What are the three biggest myths about looking after my smile? There were reports in the media recently had about how cleaning in between your teeth is not necessary but take it from me that people who don't clean between their teeth develop more problems with gum disease and decay then those whose cleaning includes flossing or interdental brushing. The truth is that whitening your teeth is a fantastic treatment when done properly. But whitening toothpaste is not in contact with your teeth long enough to have the same effect as teeth whitening at your dentist can. There are also some whitening toothpaste that work by having abrasives in them that they can damage your teeth – so I definitely wouldn't recommend those! Nothing could be further from the truth. If you have a dentist who cares and is gentle, then they can make every treatment painless. What should I do about sensitive teeth? There are many reasons for teeth to become sensitive so, honestly speaking, the best thing to do is to see your dentist so that they can find out how the sensitivity is being caused. A common reason for sensitivity is exposure of the inside part of the tooth that we call dentine. If you look at it under a microscope, you see that there are tiny microscopic holes on its surface. Commonly, if you brush with a toothpaste designed for teeth sensitivity, such as Sensodyne, its tiny particles help to plug those tiny holes. It’s really important to remember not to rinse your mouth if you are trying to use the sensitive toothpaste as that will rinse all those particles away and you will not get any benefit. What do you use to get rid of stubborn stains? There are two types of stains that affect teeth – extrinsic stains that sit on the surface and intrinsic stains that penetrate into the body of the tooth. Extrinsic stains can be cleaned off and seeing your dentist or hygienist for cleaning and air-abrasion is the best way to ensure that they are safely removed. If, however, stains have penetrated into the tooth structure, then you will need teeth whitening to remove them. Teeth-whitening is a fantastic cosmetic treatment – it's safe, predictable and the results are long lasting. Plenty of research has been done and has proved that whitening causes no damage to the tooth structure whatsoever. You must see a dental professional to have whitening done though as it is illegal and potentially dangerous to have whitening done by someone who is not trained and may not use the correct products. What three dental treatments would you recommend as anti-ageing solutions? The three things that most commonly happen to the mouth as we age or their teeth become worn, they can become misaligned and we can start to lose teeth. If teeth become worn, we can build them back up using tooth coloured filling materials and also crowns and veneers. We can get such a wonderful result with them. We can really improve your ability to chew and bite and really transform not only your mouth, but the whole of your face because you will have a far more youthful smile once again. If teeth are crooked or misaligned, you can straighten them using traditional or invisible braces, such as Invisalign. The process is painless and can take a lot less time than you think. If teeth are missing, you can replace them with fantastic replacements such as dental implants. Dental implants are inserted into the jawbone and become an incredibly strong and secure fixture that we can use to hold a restoration that really looks and feels like it's your own tooth!